The Color Factory NYC is officially open to the public as of Monday, August 20, and the experience is red hot. Actually, it covers a spectrum of hues, and it is guaranteed to be one of the most vibrant, educational and downright enjoyable Instagrammable moments you’ve encountered in New York. It really blue us away. 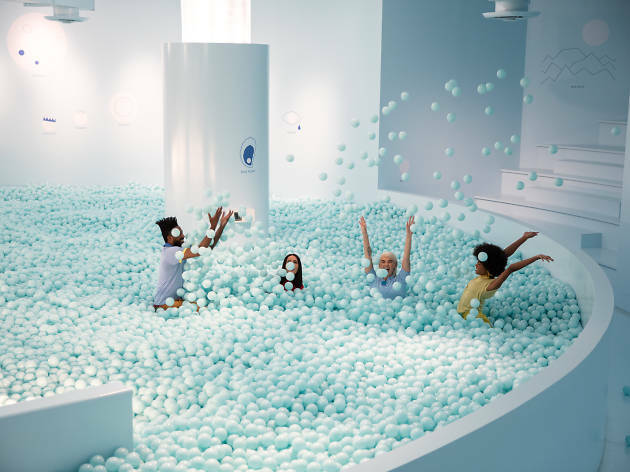 The interactive exhibition, which is located in Soho, was designed and launched by event planner Jordan Ferney of Oh Happy Day (a crafts and celebrations blog) to help visitors explore the fun and importance of color. There are 16 rooms to explore throughout the 20,000-square-foot space which showcase immersive artwork from local writers, poets and musicians. The event got its start in San Francisco, but the Gotham iteration is very much an ode to New York, as there are various poems and tips for folks who live in the Big Apple throughout. 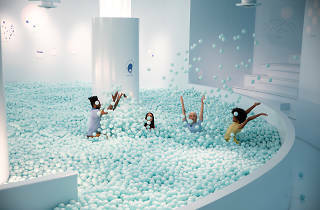 Similar activiations such as a baby-blue ball pit remain in addition to a disco-themed dancefloor, oddball artifacts (think puke-inspired art) presented by the Mmuseumm and more. Best of all, you can wander through the installation phone-free (if you want.) Upon entry, you are given a card to scan at each of the various photographic experiences inside. The photos will be sent directly to your email, so you can focus on enjoying the art versus panicking over taking the perfect picture. That’s pretty convenient, but what we really love is that this ticketed attraction ($38) is worth the price in freebies alone. During your visit, you get a ton of swag from gifts like Maybelline lipstick to ice cream, candy and other special treats. Tickets are still up for grabs at various time slots. It’s only in town until the end of September—don’t miss the chance to see (and taste) the rainbow!